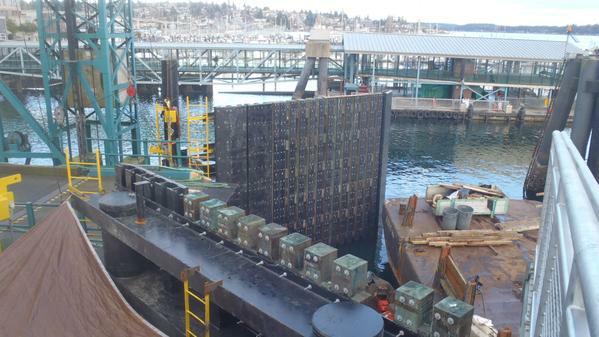 By the end of Tuesday, the Bremerton ferry terminal was supposed to have a new wingwall to guide ferries to the dock. Crews went in the water to remove and replace the battered wingwall, the last timber one in the system. They’re now made out of hollow steel pilings. The job was expected to last through February. At Kingston and Edmonds, crews recently repaired and preserved dolphin piers — in-water structures used as landing aids for approaching ferries. 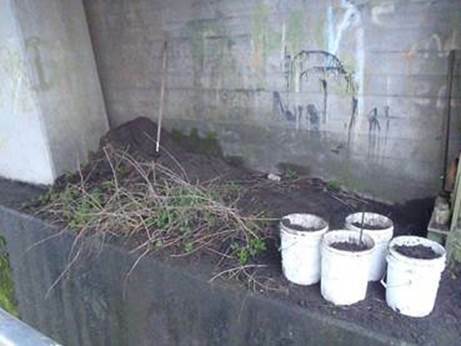 The first week of cleaning went well on the Agate Pass Bridge, the Department of Transportation says. You can see above all the crud that piled up over the years in the before and after photos. Each day, traffic was reduced to one alternating lane across the bridge from 8:45 a.m. to 3 p.m. Knowing this, 15 percent of drivers stayed away during work hours, allowing flaggers to keep delays to a minimum, typically between 5 and 20 minutes. Only two grumps complained. DOT says it would help them if people could reduce discretionary trips, change their schedules, and use the Kingston and Bremerton ferries instead of Bainbridge. 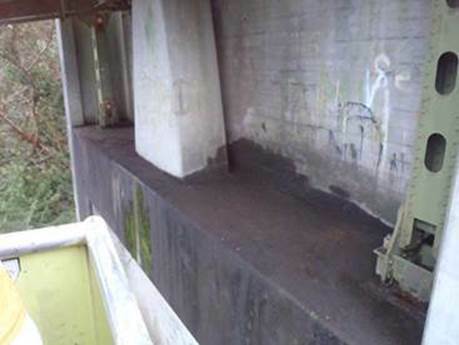 Crews have been simultaneously cleaning the bridge, making repairs and retrofitting the railing. No significant repair issues have been found. They’ll work throughout the weekend, reducing the bridge to one lane at 7:45 a.m. on Saturday and Sunday, an hour earlier than weekdays. On Monday, they’ll open the lane at 2:45 p.m., to accommodate President’s Day traffic. Port Orchard mayor Tim Matthes’ city council removed him from the Kitsap Transit board for more fast-ferry-friendly councilman Rob Putaansuu, but Matthes didn’t let the move silence him. He supports 30-minute trips to Seattle, but worries about the boat. The lightweight, low-wake, one-of-a-kind Rich Passage 1 is too expensive and possibly unsafe, he wrote last month to the board. Doubters applauded. The agency responded, investigating the allegations and presenting findings during a study session Tuesday. Matthes, who was there, seemed mostly satisfied. “I appreciated that you took the time to do that,” he said. He did recommend that the boat undergo dye penetrant, ultrasonic and X-ray tests to establish a baseline. Anne Blair, Bainbridge Island mayor and transit board member, thanked him for playing the devil’s advocate with a board that leans the other way. Much literally hinges on the hydrofoil, a 14-foot wing that extends across the catamaran’s tunnel, providing lift so the boat displaces less water. The foil has been through hell during it’s short life, but emerged better for the experience, said fast ferry consultant Carla Sawyer. It fell off during sea trials in March 2010 and had to be fished off the bottom of Bellingham Bay. After being re-engineered by a national expert and reattached, it fared well during a second round of sea trials and a four-month test carrying passengers between Bremerton and Seattle. In January 2003, the ferry ran aground on the way to a Port Townsend shipyard and the foil’s paint was scraped up. In December 2013, a heat blanket keeping moisture out while the boat out of the water caught fire and the foil was damaged. Matthes claimed it sustained excessive stress cracks but Sawyer said only the laminate cracked. Repairs strengthened the joint, she said. Sawyer addressed a list of problems Matthes said seem to grow with every sailing. “Excess vibration”: None have been reported, Sawyer said. “Diesel motor mount failure causing redesign and retrofit”: The was no failure. New mounts were installed to make the boat quieter. “Cavitation when boat operates at hydrofoil speed”: Cavitation is typical. “Repairs and replacement of jet drives”: Impellers were damaged when they sucked up gravel during the grounding. “Exhaust falling off”: Never happened. Three of four had cracks that were temporarily repaired while the boat was operating and later rebuilt stronger. “Damage to saltwater systems because of dissimilar materials”: There was premature corrosion in the fire/bilge pump system. It was replaced. “Diesel motor warranty and repair work.”: There has been no repair work to the engines. Special painting needed because wrong material was used in strut design”: Some paint eroded. Changes were made to reduce cavitation. “High maintenance and operating costs”: Operating costs are in line with industry standards. Boat is built out of aluminum and composites, which require little maintenance. RP1 doesn’t fly on top of the water at 135 mph, Sawyer said. At cruise speed, it lifts about two feet, leaving one foot of the hull in the water. If the foil fell off, it would just sink like last time and the boat would drop down on its hull. There would be no violent action or injuries. Board members showed most interest in Matthes’ assertion that the engines are over-stressed and will will wear out quickly. The boat has to race at 37 knots through Rich Passage to create the least wake, which is 90 percent of rated capacity. The rest of the time it runs at 32 knots, 65 percent of capacity. She requested that manufacturer Caterpillar be consulted. Kitsap Transit takes passenger safety seriously, said executive director John Clauson.